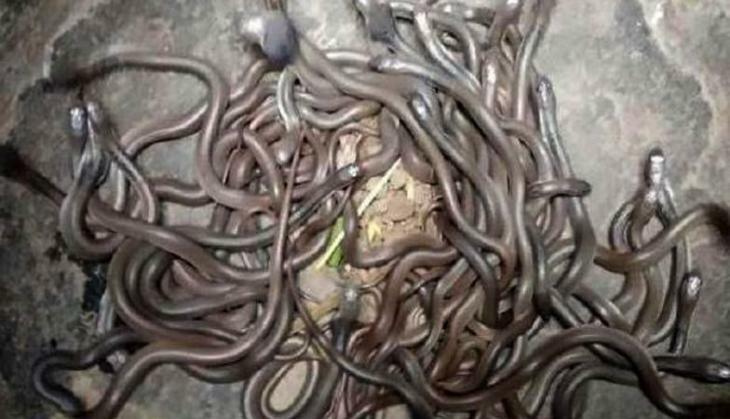 In a bizarre incident, a family in Odisha's Bhadrak district were shocked to know that they were unknowingly used to share their house with hundred of venomous cobra babies. With the help of forests officials and snake catchers the tiny but dangerous and highly venomous snakes from their house were removed. The baby cobras will be released into their natural habitat, away from human habitation, say forest officials. 111 baby cobras and 20 eggs were found in a labourer's mud house in Paikasahi village on Saturday. Two adult snakes were spotted the next day, Divisional Forest Officer of Bhadrak, Amlan Nayak, told news agency PTI. "The sight was unbelievable. 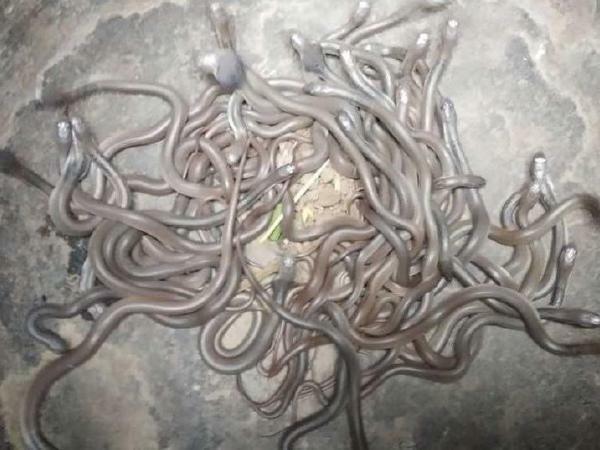 Hundreds of baby cobras were found bundled up under the floor," Mr Nayak said to Times of India. The baby cobras are believed to be up to three-days-old. The adult cobras, a male and a female, are around 2.10 meters in length, reported PTI. A rescue video shows the baby snakes writhing about and coiled up around each other. A few even have their hoods raised and can be heard hissing and spitting. Cobras can lay up to 30 eggs and they hatch within 45-60 days, Subhendu Mallik of Snake Helpline told NDTV. "Is it a coincidence that the cobra babies hatched on a single day? Is it a coincidence that all the snakes laid their eggs on the same day, same time? Where are the empty eggshells?" the snake expert asked, urging forest officials to probe the bizarre discovery.